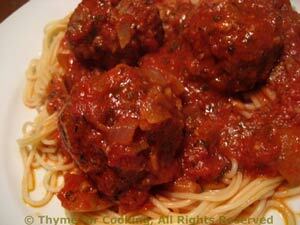 Spaghetti with Ginger Meatballs, Thyme for Cooking easy pasta. Fresh ginger and a bit of soy sauce add a subtle Asian flavor to these meatballs. Roughly chop onion, then mince 1/4 of it. In a large bowl, lightly beat egg with a fork. Add bread crumbs, mustard, vinegar, soy sauce, half of the ginger, garlic, herbs and the 1/4 minced onion. Mix well, add beef, mix well (use your hands). Form into meatballs, about 1.5" (5cm) in diameter. In large nonstick skillet heat oils over medium heat. Add remaining onion, garlic, ginger and pepper. Sauté until tender and onion is transparent, 5 - 6 minutes. Add tomatoes, sauce, tomato paste, soy sauce and remaining herbs. Drop the meatballs in carefully, trying to keep them separate. Cover and simmer until meatballs are done, about 15 minutes. Stir once or twice. Pour meatballs and sauce over the top and serve.